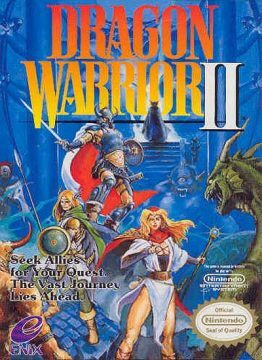 Dragon Warrior II (the Japanese subtitle translates to “Pantheon of Evil Gods”) takes place 100 years after the original, although the general plot is pretty much the same – an evil warlock by the name Hargon is wreaking havoc on the land, and has destroyed the neighboring Castle of Moonbrooke. As the Prince of Midenhall, it’s up to you to gather a group of warriors and exterminate this evil from the land. This is you, basically. The Prince of Midenhall is a descendant of the great Erdrick. 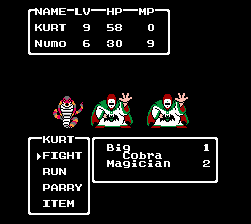 He’s a physical fighter, without any magical abilities at all. 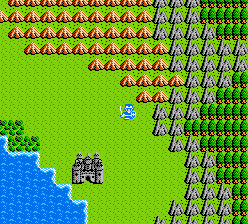 His kingdom is named Lorasia in the Japanese Famicom and English GBC versions. Your cousin, the Prince of Cannock, is also off adventuring, and you need to catch up with him. 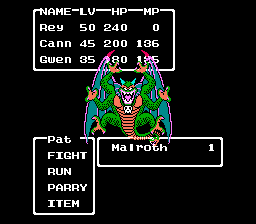 He’s weak but is the first character you get that can use magic. 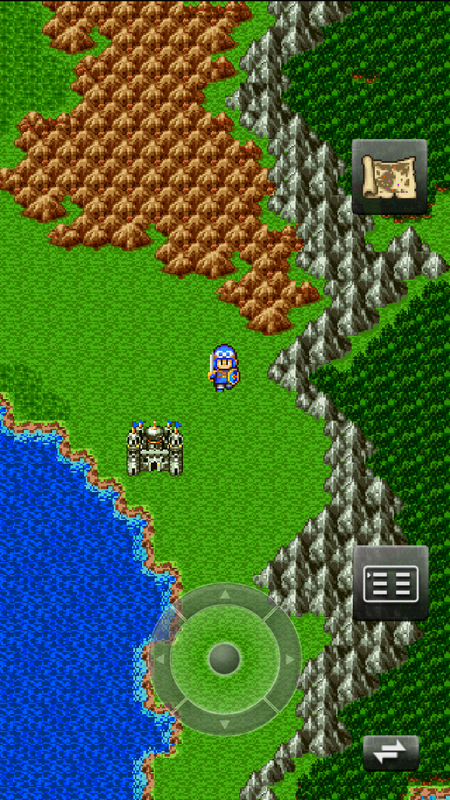 His kingdom is named Samaltria in the Japanese version. 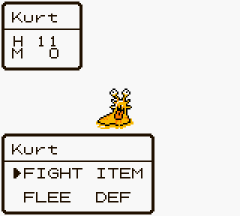 His real name is randomly generated from a pool of preselected names. 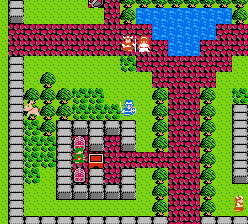 The lady of the destroyed castle has been cursed to take on the form of a dog, but when you cure her, she joins the party. She’s an adept magic user. 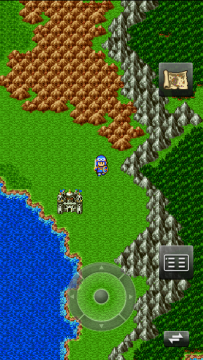 The battle system has been expanded so you now fight multiple enemies at once. To accommodate all of the monster graphics on the screen at the same time, the battle background are now completely black, as opposed to the landscapes of the original game. 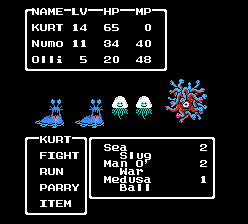 However, there are some strange quirks to this system – you can only target monsters by group, as opposed to targeting them individually. 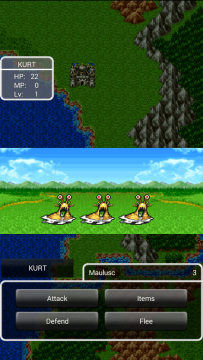 So if you’re facing three slimes and choose to attack them, your character will randomly pick one to attack. 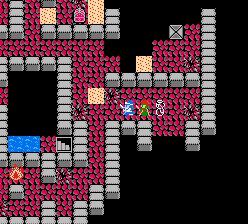 If the enemy survives and you attack again, you may end up fighting a different slime, making it impossible to focus all of your strikes on a single foe. 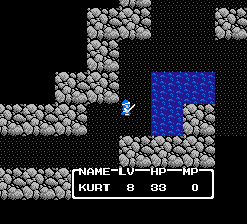 And like the original Final Fantasy games, the game doesn’t autoselect a new target once a foe is killed, so it’s very possible to waste turns if you don’t spread out your attacks. The balance feels off too – when you run across a new party member, they’ll start on Level 1, leaving them easy prey in many battles. Even after you level them up, the Prince of Cannock and Princess of Moonbrooke have extremely weak defenses compared to the hero. Due to the expanded roster, item management is even more of a hassle. 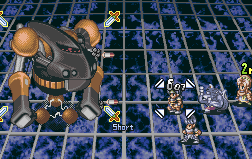 Each character can only hold eight items, including equipment and plot items. By the end of the game, you have precious little inventory space for herbs and other things. The world map is significantly larger than Alefgard, with many more towns, castles and dungeons. 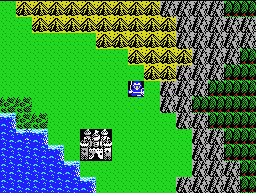 In fact, the entire kingdom of Alefgard appears in Dragon Warrior II as an island. Although it’s significantly smaller than the original game, the basic layout is the same, and you get to revisit a few old locations. This includes Dragonlord’s castle, where you can find the descendant of the evil lord, who actually helps you out this time around. 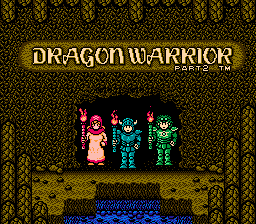 The first Dragon Warrior only had a single key – this time, there are three different keys to find, and even more treasure troves to unlock. Thankfully, there’s now more than one location to save your game – there are now several castles, each one with a king that can record your progress. Although you still need to do a lot of walking to get to places, there’s now an item that quickly warps you back to your last save spot. At one point, you even get a ship to sail around the seas. 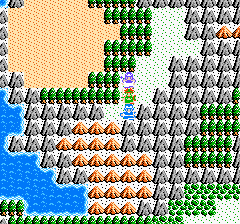 Unlike Final Fantasy, where you could only dock your ship in certain ports, you can land anywhere with your ship in Dragon Quest II, allowing to you practically explore the entire game world. 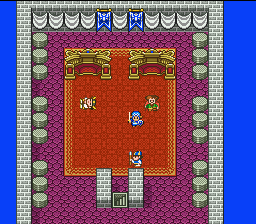 If a party member is killed in combat, they need to be taken to a church (or “House of Healing” in the NES version) to be resurrected. 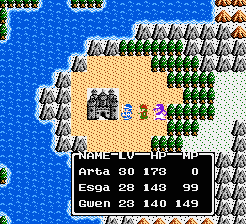 These places can also cure poison or curse status ailments, which are also new to Dragon Quest II. The dungeons are now quite a bit more advanced and actually look distinct, compared to the bland red brick dungeons of its predecessor. The torches have been ditched, and you can now see your immediate surroundings when exploring caves. 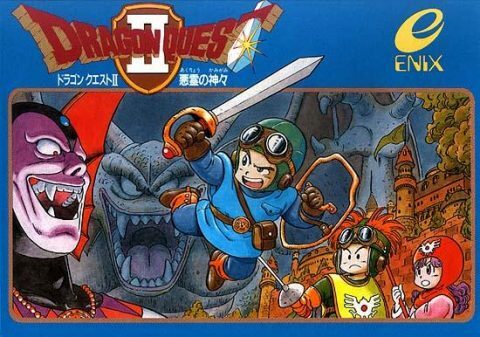 This was kept for all subsequent Dragon Quest games on the NES There are several towers where you can fall down pits or jump off the edge, tossing you down to lower floors.. You can also find lottery tickets which will let you play games of chance in certain towns, and is the first of many implementations of gambling found in the Dragon Quest series. 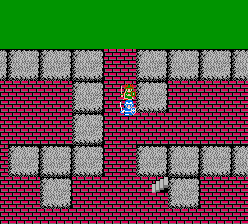 The graphics are roughly on the level as the English version of Dragon Warrior I – that is to say, better than the Japanese DQI, but still pretty primitive. The music quality has improved a tiny bit, even if some of the compositions (especially the battle theme) are a bit strange. 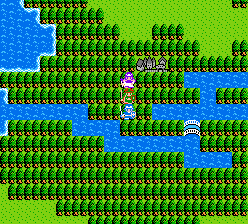 So even though Dragon Quest II adds a lot to the original, and even fixes a few of the more annoying problems, it has its own issues that will undoubtedly prove frustrating. 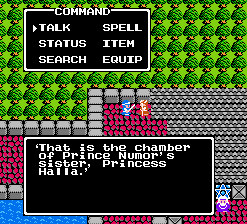 Indeed, while the series eventually received the reputation as an RPG that anyone could play, this game, particularly the NES original, is absolutely brutal on its difficulty. 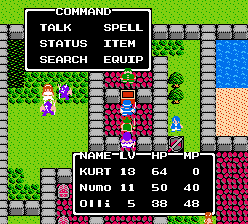 Like the first game, the Japanese version of Dragon Quest utilized passwords, which grew to obnoxiously long lengths due to the game’s complexity. Thankfully, this was replaced with a battery save for the English version. 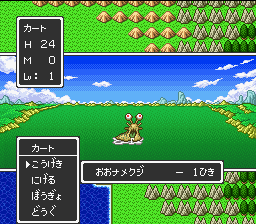 Since the Japanese version already had the improved graphics and control that had been implemented in the English Dragon Warrior I, not much of the actual game was altered, with the exception of the usual name changes and censorship. 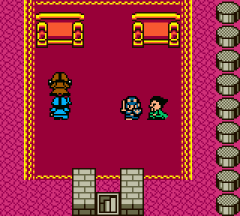 However, the English version does have a completely new title screen featuring the three warriors marching towards the screen, in addition to expanded prologue that shows the destruction of the Castle of Moonbrooke. 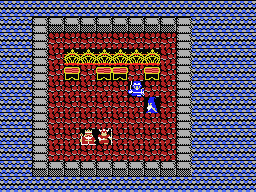 The Japanese version simply begins with the Moonbrooke guard stumbling onto the throne room and begging the King of Midenhall for help. 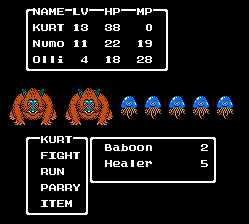 There’s also a bit of censorship in the American versions – in addition to altering the religious symbols in the church, the defeated party members follow you around as ghosts. In the Japanese version, they were represented by coffins with crosses on them. 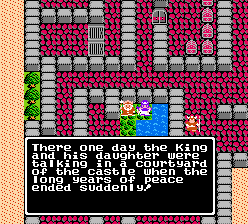 Dragon Quest II was also ported to the MSX. The scrolling is choppy and all of the characters titles are surrounded by black. 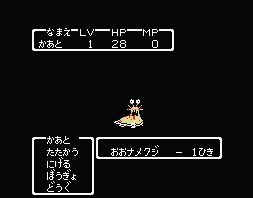 In general, the graphics are inferior to the Famicom version, and the menus and combat are sluggish. Despite these issues, it’s also a bit of a collector’s item. 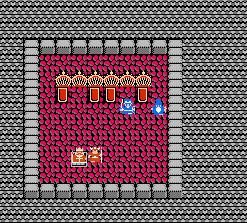 The MSX2 version is an improvement, and puts it about on the level of the FC original. 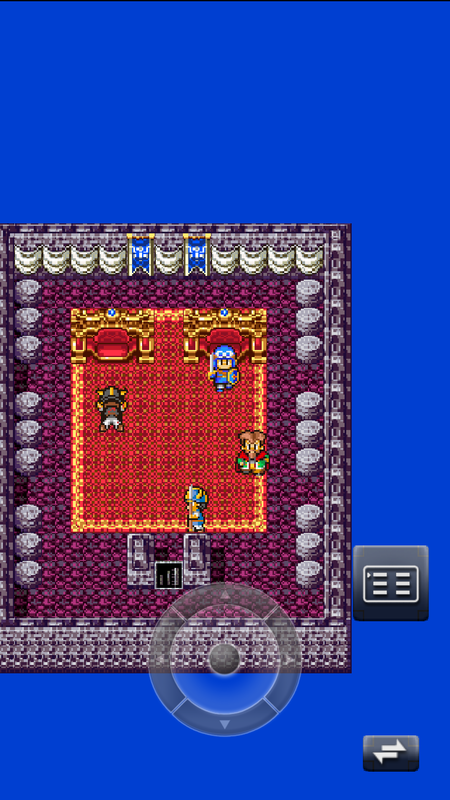 Dragon Quest II was bundled with the original and remade for both the Super Famicom. 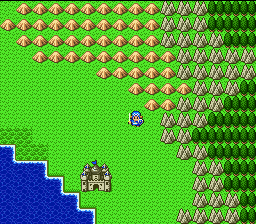 Again, it’s utilizing the Dragon Quest V engine and includes the same enhancements done to the first game, with better graphics, controls, and music. 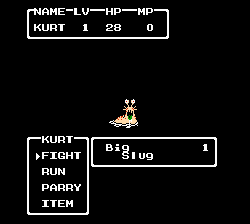 Additionally, your party members will automatically attack a different monster if their previous target was killed, so they don’t waste a turn. 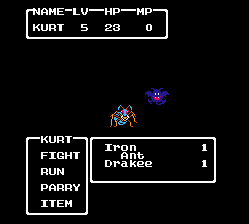 It was later released on the Gameboy Color, which was released in English, and like its predecessor, features a retranslation that stays more faithful to the original names. 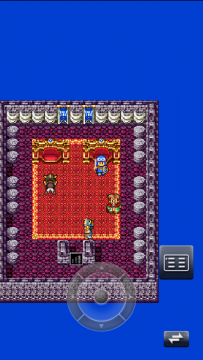 There’s also a new subquest where the Prince of Cannock will get sick and leave your party. You can choose to look for medicine for him, or just leave him be and venture on without him. There’s also a brand new intro cinema. 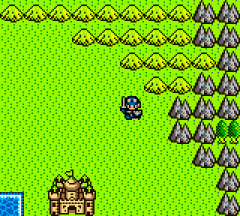 As with its predecessor, Dragon Quest II received another set of new graphics for a Japanese mobile phone port, which was used as a basis for a smartphone version. 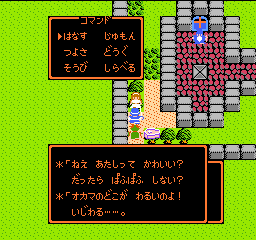 While it also has a brand new English translation, it suffers from the same ugly, misscaled tiles as its predecessor. 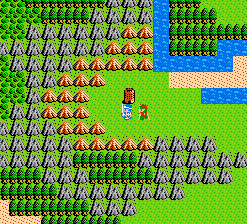 Dragon Quest III Dragon Quest Dragon Quest IV: The Chapters of the Chosen Dragon Quest V: Hand of the Heavenly Bride Dragon Quest VI: Realms of Revelation Dragon Warrior VIII: Journey of the Cursed King Star Ocean Hydlide Dark Half Parodius Da!